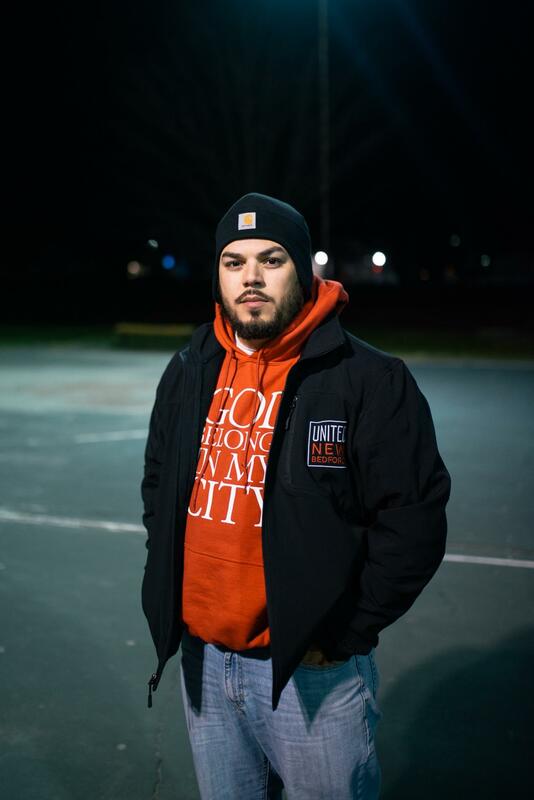 Meet Edwin Cartagena, 31-year-old Community & Family Engagement Coordinator at City on a Hill Charter School and President of United New Bedford. Edwin was born and raised in Brockton, MA until the age of 9. During that time, both of his parents were struggling with addiction, while he and his sister were taken in by their grandmother. At age 9, his mother had gotten custody of them and he moved with her to New Bedford. Although she was still struggling with her addiction, they stayed with her as they bounced from different people’s homes and motels, until finally getting their own home in Presidential Heights. While living there, Edwin got involved with the street lifestyle and all that it encompassed, which led to him getting kicked out of school his senior year and then his home. This lasted for a long time and brought him to the lowest place he has ever been in his life. He was facing legal issues and because of that wasn’t able to get a job to provide for his girlfriend, now wife, and child. He attempted to take his life but at the last minute he made a plea for God to show himself if he was real to save him from this. It was then he remembered everything that happened until that point and saw every moment God had been there to save him from destruction. Now Edwin uses all of those bad experiences to provide hope for others. He has since then gotten his GED and is attending school to get his degree in Business Management. He also works for the City on a Hill Charter Public school, where he works to provide families with resources on how to get enrolled in the school and puts on events for those students and families already involved with the school. Edwin also runs the operations of United New Bedford, an organization he and his wife started in 2013 to help bring life, hope, and love back to this city. Most noted for their I Love my City event at Buttonwood part which follows the God Belongs in My City prayer walk from city hall, those are just the beginning ideas they have. With the newly implemented Adopt A Block program, they hope to reach all of the broken and hurting communities in New Bedford, one street at a time.